It is no doubt that Oral B Pro 7000 and Sonicare DiamondClean are top range premium electric toothbrushes with features that make teeth cleaning effortless, fun and most importantly effective. They both leave you with that feeling you get after you leave a dentist chair after a thorough clean. So what exactly makes these two flagship toothbrushes tick? Let’s find out by first exploring key features and how they can benefit you in your teeth cleaning regime. Sonicare DiamondClean employs the Phillips brand’s patented sonic vibration technology that uses 31,000 brush strokes-per-minute to break down and clean plaque from the teeth. The bristles on the brush head are shaped like diamonds, hence the name. The bristles effectively combat plaque to clean the teeth, remove stains and whiten them. It has 5 brushing modes. These include; White, Clean, Polish, Sensitive and Gum care. Its body is smooth and curved, with one physical button that is both the power button and the mode-switching button. It has 5 indicator lights to indicate the current brushing mode. It comes with two replacement brush heads of the same model, with heads that are similar to those of manual toothbrushes. This helps users who are transitioning from a manual toothbrush to an electric one adapt better and faster. It also comes with a Phillips Quadpacer timer that will prompt you to move onto brushing the next quadrant of your mouth every 30 seconds. On a full battery, it can last for about 20 days in between charges, even with frequent use. It comes with a charging glass that can double up as a rinse glass, and a USB charger. Lacks skid-resistant handling, however, it is not slippery when handling. Uses 3D technology for unrivaled cleaning action. Pulsations, rotations, and oscillations of the brush head work together with the angled bristles to break up and remove plaque from the teeth and along the gum line. The brush head is round to wrap around each individual tooth, with bristles angled at 16 degrees for precision cleaning. Has 6 modes; Daily Clean, Gum Care, Whitening, Sensitive, Deep Clean and Tongue Clean. Has a pressure sensor that lights up and stops pulsations when you brush too aggressively. This minimizes damage to the gums and teeth. Using Bluetooth technology and the Oral B app, your oral hygiene habits can be monitored over time and improved for the better as it provides real-time feedback. It also gives oral care tips and senses when you are brushing too hard. It comes with 3 different replacement brush heads; CrossAction, ProWhite and Sensitive. In addition, it is compatible with a wide range of Oral B Brush Head Refills. Comes with a SmartGuide timer that will let you know when your 2-minute brushing time is up. Provides superior, precision 3D cleaning that gives you real-time feedback on your teeth cleaning. Has 6 brushing modes that enable you to customize the cleaning session to your specification. Has Bluetooth capabilities and app support: you can sync your teeth cleaning data with your smart devices. Has a pressure sensor to eliminate over brushing, brushing too hard can damage your gums, so having a pressure sensor is quite helpful in controlling the pressure you exert when brushing. Comes with 3 replacement heads, for your convenience, some brush heads have unique feature that helo you customize your cleaning. Shorter battery life of 10-12 days after a single charge compared to the Diamondclean. The DiamondClean can be charged using a USB charger even directly from a laptop. It can be charged using its charging glass too. the Pro 7000 uses pulsations, oscillations, and rotations technology. The Pro 7000 uses a more traditional charging stand. The Pro 7000 comes with 3 different brush heads. the Pro 7000 battery life goes for about 10 days. Cleaning technique: Just like the age-old Oral B vs Sonicare, the DiamondClean uses sonic vibration technology, while the Pro 7000 uses pulsations, oscillations, and rotations to break up plaque from the teeth. The Pro 7000 has Bluetooth capabilities that improve functionality while DiamondClean does not. The DiamondClean can be charged using a USB charger even directly from a laptop. It can be charged using its charging glass too. The Pro 7000 uses a more traditional charging stand. The DiamondClean comes with 2 brush heads of the same model. The Pro 7000 comes with 3 different brush heads. The Pro 7000 has a pressure sensor which the DiamondClean lacks. The Pro 7000 has skid-resistant handling on the body which the DiamondClean lacks. The DiamondClean has a longer battery life of up to 20 days on a full charge while the Pro 7000 goes for about 10 days. The Pro 7000 has a round brush to align around each tooth head while the DiamondClean brush head is shaped more like a manual toothbrush head. They both have LED displays to indicate the current brushing mode. Both have timers to ensure that you brush your teeth for a total of the recommended 2 minutes. Both come with replacement brushes. They both have rechargeable batteries. As you can see, each toothbrush has its distinct pros and cons. The choice between the two brushes lies heavily upon personal preferences. The DiamondClean’s ease of use and minimalistic design ensures a simpler experience for users, especially those transitioning from manual to electric toothbrushes. 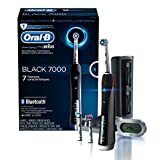 The Pro 7000 provides more features, more cleaning modes, more brush heads and a more intuitive experience with real-time feedback, and would be better suited for a user who is already used to electric toothbrushes and is looking for something more.